Most people love the beach, but not usually during the off-season. A few oddballs like my wife and me have a hard time appreciating the beach except in the offseason. Lying on beaches can lead to skin cancer, and since my father is predisposed to it, I figure I could be too, so I tend to limit my exposure. Moreover, if you live inland, then getting to the beach can be a hassle. It is particularly a hassle if like me you live in Northern Virginia. To reach the closest beaches you will have to take many frequently traffic-clogged roads. The trip includes a journey over the majestic but often congested Chesapeake Bay Bridge. Once on Maryland’s Eastern shore, you then have to brave U.S. 50, which during the summer can turn into a hundred or more miles of stop and go traffic. In short, given its cost-benefit ratio, the community pool is much more convenient. While lounging on a beach holds little appeal to me, seeing a beach ecosystem in a largely unspoiled state has a lot of appeal. My wife and I heard for years about Assateague Island on the Virginia coast, but until last weekend never actually took the time to visit it. The Assateague Island National Seashore, which actually spans parts of the Virginia and Maryland coastline, is a large stretch of shoreline left pretty much the way nature intended it. The Eastern Shore of Maryland, more correctly called the Delmarva Peninsula, is serious chicken country. If you are familiar with the Perdue brand, you might say it is Frank Perdue country. Would Salisbury, Maryland be the big city it is today without his oversized influence? It is hard to say. The peninsula has only two major cities of note, Salisbury being one and Dover being the other. We did not pass through Salisbury, but instead passed around it, passing through smaller cities and towns like Princess Anne and Pokomoke City as we headed south on U.S. 13. Aside from the occasional chicken barns, you will find a lot of mostly empty flatland and scrub pines. Civilization does not quite disappear but it does recede. If your idea of a fun way to spend Friday night is dinner and a movie, you might have to travel all the way to Salisbury to see the movie. While Assateague Island was our final destination, the inland island next to it, Chincoteague Island, was our base of operations. To get there you pass the Wallops Island Flight Center then drive down a long causeway and finally over a rickety bridge onto the island. (A new bridge is being built, and not a moment too soon.) Chincoteague is well populated with houses, B&Bs, motels and places to eat, yet it is small enough to feel somewhat remote. Wal-Mart has not made it to Chincoteague and likely never will. Most of the B&Bs were closed for the season, so we stayed at the Hampton Inn instead. Hampton Inns are good bets in general, but this particular hotel was the nicest and fanciest Hampton Inn we had ever stayed at. All rooms faced the sound and it was crazily quiet, clean, modern and almost ornate. The Jacuzzi looked very inviting, particularly since a cold rain was falling outside and we were chilled to the bone. It was not an option for us, as we had not packed our swimsuits. Our view from our third floor window revealed a number of moored trawlers nearby and noisy ducks squawking on the dock. There was not much is happening on a cold and wet March evening in Chincoteague. Yet, some restaurants were open including Bill’s Seafood Restaurant, which was conveniently right down the street. It was crowded like it was the middle of tourist season, which is a sign of a good restaurant. It helps to be a seafood lover if you come to Chincoteague, otherwise you may find your dining options limited. The rain combined with a driving wind made us wonder if we made a mistake with the timing of our visit. So instead, we spent the evening huddled inside our hotel room, watched Son of Rambow on our portable computer, and hoped for better weather in the morning. Our large king sized bed proved exceptionally comfortable. Morning offered us overcast skies but a temporary abatement of precipitation. After filling ourselves with the standard Hampton breakfast fare, we headed over to Assateague Island, reached by yet another bridge. As soon as you pass over the bridge, you realize you have left civilization behind. The weather may have been cold, but it had the virtue of being too cool for insects. Maybe visiting Assateague in mid March was a brilliant rather than a stupid idea. There are a few but not many manmade structures on the island. They include two visitors’ centers, only one of which has flush toilets and a historic lighthouse. The warmth of the visitor’s center was welcome. Inside on a television we could watch the nest of two bald eagles and their two eaglets. From the visitor’s center, it was a short drive to the beach. While it was not raining, the temperatures in the high thirties, the wind and the moisture made it feel quite cold. The weather did not stop a small boy from chasing a seagull feather down the beach. There were not many cars on the beach, which was part of its allure. As long as you were bundled up, you could sit on the sand, enjoy the pounding of the surf and ponder the immensity of the Atlantic Ocean. Assateague Island is probably best known for its wild horses and ponies, which are probably not native to the island. You cannot pet them and for the most part, they wisely prefer to stay away from humans. We were able only to catch glimpses of them with our binoculars. There is other life in great abundance on the island, but you have to know where to look for them. We found them in the Assateague Park Pond. As ponds go, this one is huge, and it is more marsh than pond. It is a 3.2-mile hike around the pond along a road that is wisely blocked from cars until 3 PM. The walk was the highlight of our weekend. The pond, which reaches a mile in diameter, was full with thousands of waterfowl, from ordinary ducks to swans and egrets. We passed a magnificent grey heron that warily watched us from less than a hundred feet away. Nearby we also observed the majestic flight of the bald eagle we had watched on TV in the Visitor’s Center. Except for an occasional exceptionally loquacious waterfowl there was little to be heard but our footsteps, the distant sound of waves crashing on the beach and the gentle squawking of thousands of birds inhabiting the pond. Many had their butts pointed toward the sky as they worked to find food in the marsh. A pristine and wholly unspoiled natural environment enveloped our senses. I count the ninety minutes we spent walking around the pond as one of the great natural experiences of my life. It is achingly sad that such experiences are so hard to find in the 21st century United States. 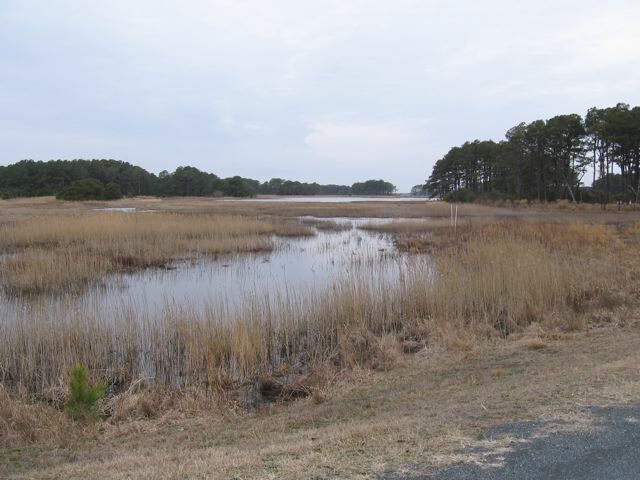 The Assateague National Seashore remains one of the last unspoiled natural ecosystems on the East Coast. If you are a naturalist, it is not to be missed. Fortunately, the rain held off until we had left the island. There was time to travel to the Wallops Island Visitors Center. Before Cape Canaveral was used for launches, the Air Force was shooting off rockets at Wallops Island. Wallops still packs rockets with a “wallop”, but virtually all its rockets are of the sounding variety. Sounding rockets make quick trips into the stratosphere or into outer space for research purposes then sail back to earth. You cannot miss a number of impressive satellite antennas and radio telescopes at the facility, including one GOES receiver that receives the bulk of the real-time field data for the system that I manage. I would have enjoyed a tour of the facility, but since it was a Saturday, the timing was not right. The Visitor’s Center though was quite impressive for a small museum, hosting an auditorium with a film narrated by Robert Redford, and large globe that acted as a projector for shows about the earth and the sun. The center also has a comprehensive set of exhibits explaining the research that went on at the facility and continues into the present day. While we saw almost no sun and endured plenty of cold and miserable rain, our two-night journey into this wilderness was well worth the hassle of traversing the Chesapeake Bay Bridge and the Capital Beltway. It felt good to commune with nature and since it is in such abundance on Assateague Island, we will doubtless return again, leaving refreshed in mind and body. Why are we surprised by the consequences of our Wild West tech economy?